24 1/4 x 30 1/4"
Tadashi Asoma was born in Japan in 1923. In 1958 he was the recipient of a Japanese Government scholarship to study painting in Paris. After Paris, he visited the United States and was fascinated with the American style of painting during that period. Eventually, he moved to New York with his family. 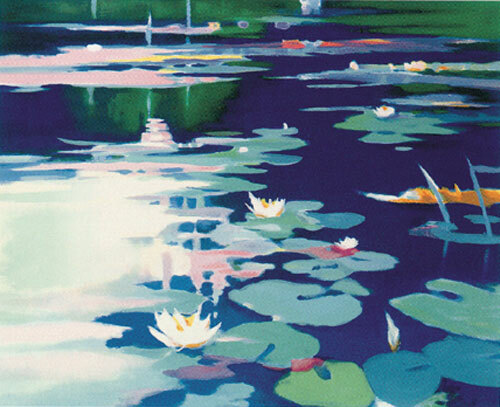 He studied and painted in New York for three years and then returned to Japan. In 1961 he returned to New York with his family and eventually settled here. The majority of Asoma’s paintings were produced while he resided in the United States. With an insatiable curiosity for color, Asoma’s current paintings reveal a remarkably adept portrayal of the changes of the seasons. His sudden bursts of pure, brilliant color with splendid differences of touch and tone, exemplify his natural originality and closeness with nature. The colors luminously conceived for the landscape, their lightly feathered textures translate admirably to the glory and jubilant majesty of nature. Asoma has participated in one-man and group exhibitions throughout the world, including New York, San Francisco, Tokyo, Switzerland and Germany. His work is included in many public and corporate collections.